Curries, macaroons, piña coladas...where would we be without the captivating culinary contributions of the coconut? Confusingly, the word coconut can refer to the tree (Cocos nucifera), its fruit, the seed contained within the fruit, or the white edible flesh contained within the seed. Coconut trees are found along the coasts of tropical places. They're native to Southeast Asia but have been introduced to areas of similar latitude all around the world. Trees grow well in sand and don't mind a bit of sea salt. Their buoyant seeds are naturally spread from beach to beach via the ocean. The hollow center of a coconut seed contains a clear, sweet, and slightly viscous liquid known as coconut water. The surrounding white flesh is grated and squeezed to obtain coconut milk, from which coconut oil is isolated. Coconuts can benefit human health, but can also cause injuries and contribute to disease. This post is about exploring the light and dark sides of the tree. An unripe and intact coconut fruit (mature fruit contain less water and cracked fruit may not be sterile) is picked and husked. A needle is stuck into one of the eyes of the seed to create an air vent. One end of a piece of tubing intended for transfusing blood is stuck into another eye. The other end goes into the patient's vein. The coconut is hung as one would a bag of saline using netting and tape, causing the coconut water to drip into the patient. In one case, which occurred in 1999, a man was admitted to Atoifi Hospital after being diagnosed with a stroke and heart problems. This hospital is on Malaita, one of the Solomon Islands in the South Pacific (so fairly remote). After a month in the hospital, the patient became weak and began vomiting. At this time, the hospital had no hydration fluids on hand, could not make their own sterile fluids, and supplies were not expected for days. Furthermore, the nearest hospital was at least a day's hike away and there wasn't money available to pay for supplies to be flown in. As a last-ditch option, the patient was given coconut water, which kept him hydrated until new supplies arrived. He returned home a couple of days later. In the same vein (heh), coconut water is touted by some as a particularly effective beverage for avoiding or fixing dehydration (say, due to athletic exertion or being mad hungover). It's appealing because it's natural, low-cal, and contains electrolytes, nutrients, and other health-boosting compounds. Coconut water appears to be just as good as your typical sports drink at keeping you hydrated and fit for exercise. However, a simple solution of sugar and salt works better in cases of serious dehydration. Liquid from coconuts was used to rehydrate folks during a cholera epidemic, but was found to be deficient in sodium and chloride, necessitating the addition of table salt. It's also worth noting that many of the nice-sounding health benefits claimed by manufacturers of coconut water sports drinks have not been thoroughly investigated. Coconut water contains many nutrients (sugars, amino acids, vitamins, and trace elements) and has been investigated as a food source for people and drug-producing bacteria. It's similar to the fancy (read: expensive) solutions used for intravenous feeding, so it may be useful for this purpose. Given its abundance and low cost, coconut water is an appealing liquid medium (or as I like to call it, nutritious soup) for growing up tanks of E. coli bacteria engineered to produce protein drugs such as insulin. Coconut finds a place among the traditional medicines of many countries. For example, coconut milk (Ghana) and tea made from either coconut shell fiber (Brazil) or coconut tree roots (Papua New Guinea) are used to treat diarrhea. There is at least some evidence that compounds produced by the tree can do useful things like reduce inflammation and pain, help with diabetes, osteoporosis, seizures, and high blood pressure, and kill parasites, fungi, bacteria, and cancer cells. Coconut oil is an interesting case. Traditionally, it's used in Haiti and Indonesia as a skin ointment for burns and other wounds. Faster wound healing due to the application of coconut oil has been demonstrated in rats, and appears to be due to the collective action of several beneficial compounds. Compared to other plant-derived edible oils, coconut oil contains a fair bit of saturated fat. Consuming a lot of this type of fat has the potential to increase your risk of cardiovascular disease. Unfortunately, it tastes delicious. Another negative health outcome associated with coconuts is being physically injured by falling out of a coconut tree (which grow up to 100 feet tall), being struck by falling coconut fruit (~3 pounds), or being struck by a falling coconut tree. Being hurt in such a manner usually means breaking your arm, skull, and/or spine. 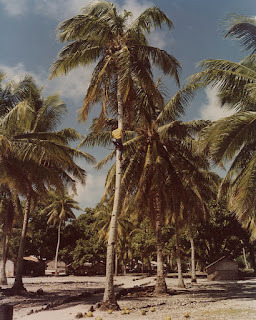 People climb coconut trees to pick the fruit, which is farmed throughout the tropics. In the Solomon Islands, where the tree is widespread and farmed by most residents, three percent of all injuries referred to the surgery department of a hospital were related in some way to coconut trees. Drinking too much coconut water is incredibly bad for you. In one instance, a 42-year-old New Yorker consumed eight bottles of coconut water, totaling just over two and half litres (88 ounces), over the course of a single summer day while playing tennis outside in the heat. Although this individual was clearly being proactive about keeping hydrated, they selected the wrong fluid with which to do so. Coconut water contains a lot of potassium, so the tennis player ended up with way too much potassium in his bloodstream (severe hyperkalemia). This disrupted the electrical conduction system responsible for coordinating the pumping of the heart, resulting in a dangerously slow heart rate (bradyarrhythmia). The tennis player also had skeletal muscle damage (rhabdomyolysis) and acute kidney injury. The kidney damage likely stemmed from the pair of organs being overwhelmed as they attempted to clear toxic muscle-derived proteins from the blood. Cocamide diethanolamine, a surfactant derived from coconut oil and found hand cleaners, creams, and dishwashing detergents, can rarely cause an allergic skin reaction (contact dermatitis). Allergies resulting from eating coconut are also rare, and can take the form of anaphylaxis or stomach upset with oral allergy syndrome. In conclusion, coconuts have all sorts of interesting ties to medicine. They're emergency medical supplies, wound healers, and bone breakers. Drinking too much coconut water can kill you. Aalto-Korte K, Pesonen M, Kuuliala O, Suuronen K. 2014. Occupational allergic contact dermatitis caused by coconut fatty acids diethanolamide. Contact Dermatitis 70(3):169-174. Campbell-Falck D, Thomas T, Falck TM, Tutuo N, Clem K. 2000. The intravenous use of coconut water. American Journal of Emergency Medicine 18(1):108-111. Fagundes Neto U, Franco L, Tabacow K, Machado NL. 1993. Negative findings for use of coconut water as an oral rehydration solution in childhood diarrhea. Journal of the American College of Nutrition 12(2):190-193. Kuberski T, Roberts A, Linehan B, Bryden RN, Teburae M. 1979. Coconut water as a rehydration fluid. New Zealand Medical Journal 90(641):98-100. Mulford JS, Oberli H, Tovosia S. 2001. Coconut palm-related injuries in the Pacific Islands. ANZ Journal of Surgery 71(1):32-34. Petroianu GA, Kosanovic M, Shehatta IS, Mahgoub B, Saleh A, Maleck WH. 2004. Green coconut water for intravenous use: Trace and minor element content. Journal of Trace Elements in Experimental Medicine 17(4):273-282.